Here's a fun chocolate fact: some bars are an excellent source of iron – providing up to 30% of the recommended daily value! That’s roughly the same amount of iron as a steak. However, not all bars are created equal, so be sure to check the labels. You want to look for brands that have at least 20% per serving (usually 1/3 of the bar). But you've been warned... this dose of iron comes with calories. The portion size will be roughly 200 calories. Chocolate’s effect on inflammation is due to its antioxidant content which comes from compounds called flavanols1. Research supports consuming 400-900 mg of flavanols daily. Unfortunately, these health-boosting elements are easily destroyed in the usual processing of dark chocolate. 1) Choose unsweetened cocoa powder and unsweetened baking chocolate. The flavanol content in chocolate is found in the chocolate solids. Unsweetened cocoa powder and baking chocolate have the highest amounts of chocolate solids so, naturally, they also have the highest flavanol content. Other dark chocolate formulations, like bars and syrups, contain other ingredients like sugar, dairy, and fat. These dilute the cocoa solids, and therefore flavanol content, per ounce. In the 1800s, a chemist discovered that processing natural cocoa with alkali resulted in a less bitter tasting chocolate, which is preferred over natural chocolate for sweet treats. But beware: alkalization removes a large portion of flavanols2. Be sure you don't fall victim to this chocolate trick by purchasing the wrong bar... Alkalized cocoa powder may also be called Dutch chocolate, Dutch-process cocoa, European-style cocoa, or chocolate processed with alkali. 3) Purchase chocolate made from solids, not liquor. Dark chocolate bars made from chocolate liquor, which is equal parts chocolate solids and cocoa butter, have much lower amounts of flavanols. Some popular brands prefer this method because it produces a smoother texture. 4) Choose chocolate that is at least 70% cocoa. Dark chocolate, by definition, contains at least 55% chocolate. Can you guess what the rest of the bar is made from? This might be easy — sugar and fat. They're used to mask the bitter taste of natural cocoa. But just because a bar has a high percentage of cocoa, doesn’t mean that it has the highest amount of flavanols. 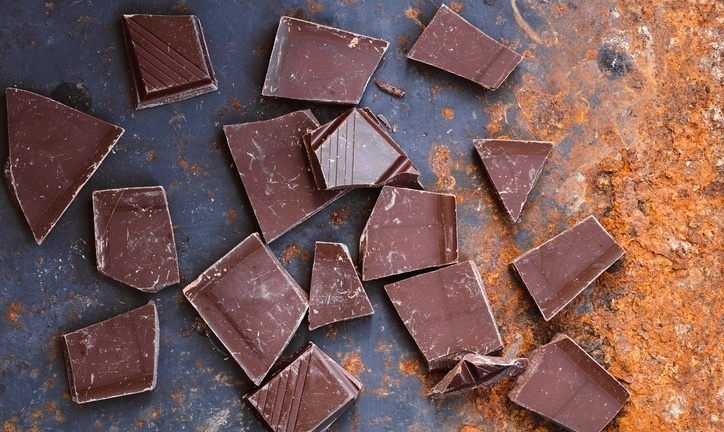 Bars that have a lower percentage of cocoa but are both non-alkalized and made from cocoa solids (and not liquor), will have a higher flavanol content than bars with a higher cocoa percentage that are both alkalized and made from liquor. Yet another example of when and why it pays to check your labels. A typical serving of 1 tablespoon of unsweetened, non-alkalized cocoa powder can have up to 400mg. High quality, unsweetened, non-alkalized baking chocolate can contain up to 200mg per serving. Dark chocolate bars have a wider range of flavanol content based on their processing, but typically have 150-250 mg per serving if they are non-alkalized and not made from chocolate liquor. Milk chocolate barely contains any flavanols with just 10-15mg per serving — best to just avoid. So, when choosing treats this Halloween, don't be tricked by the labels and pick the best bet for your biomarkers. Miller, Kenneth B., et al. "Impact of alkalization on the antioxidant and flavanol content of commercial cocoa powders." Journal of agricultural and food chemistry 56.18 (2008): 8527-8533.